Tempeh is a delicious Indonesian fermented food, traditionally made from soybeans. It is comparable to beef in percentage of protein, high in fiber, low in saturated fat and has no cholesterol. Its rich, nutty flavor and chewy texture make it extremely versatile in vegetarian cuisine. 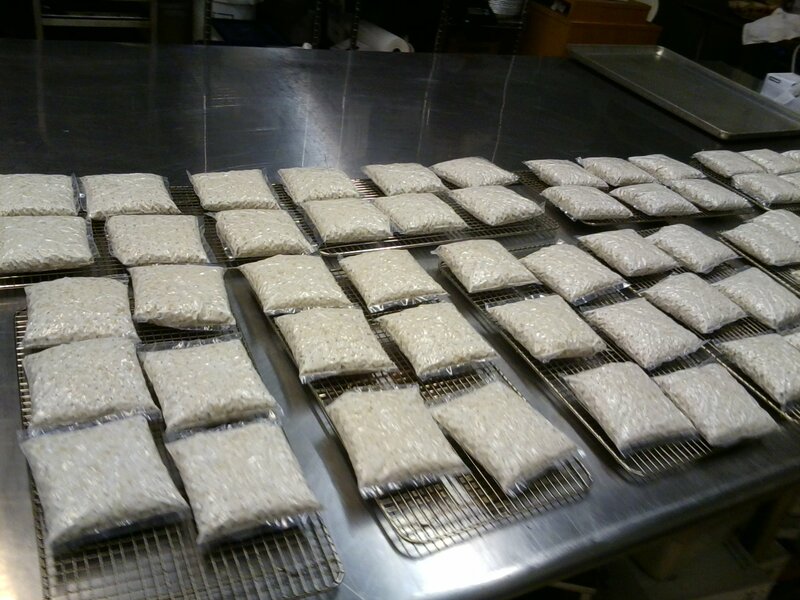 The process of making tempeh involves partially cooking soybeans, inoculating the beans with Rhizopus spores, and incubating until the beans become a cake held together by dense white cottony mycelium. During the fermentation process, enzymes partially break down the soy proteins, oils and carbohydrates making them easier to digest. This process, similar to cheese making, gives tempeh its delicious flavor and meat-like texture. Tempeh has a higher protein content than tofu. It also has more dietary fiber and vitamins. Its texture is firmer and the flavor is stronger. This centuries old Indonesian staple continues to spread throughout the world and is increasingly eaten by both vegetarians and omnivores. Is your tempeh organic and non-GMO? Our handmade tempeh and tempeh sausage are made with 100% Organic Certified ingredients. Our soybeans are certified GMO-free. Yes! All of our products are gluten-free. Our Tempeh sausage is made with certified gluten-free oats from Golden Prairie. Beans have enzyme-inhibitors that interfere with the digestion of protein. The fermenting process in tempeh removes these inhibitors, making the protein more digestible. Enzymes break down the protein, fats and carbohydrates in the beans. They transform the oils into free fatty acids, which contribute to the tempeh flavor. The fermentation process also makes the zinc, iron, calcium and magnesium in the beans more absorbable. Tempeh makes soy’s isoflavones more accessible for the body to absorb. Isoflavones strengthen bones, help to ease menopause symptoms in women, and reduce risk of heart disease and cancer. Genistein, a naturally occuring isoflavone found chiefly in soy foods, has been consistently linked to lower incidence of prostate cancer in men. Tempeh is high in protein, essential fatty acids, calcium, iron, fiber and potassium, while being low in fat and sodium. It also is cholesterol-free. You’ve just pulled your tempeh out of its wrapper only to find it has black spots on it! No need to worry, the black spots are perfectly normal and edible. Under a microscope, the rhizopus mold looks like a tiny mushroom colony. The white mycelium is what holds the beans into a compact cake. 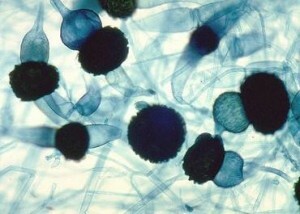 The black spots are spores, similar to what is found on the underside of a mushroom. As the tempeh matures in the incubator, it begins its reproduction process, and starts to sporulate. The black or gray patches are completely harmless and actually indicate that the tempeh has matured to its peak of flavor. In Indonesia, where tempeh originated, some recipes call for overripe, or very dark tempeh. If your tempeh has colors other than black, white or gray, please do not eat it. The aroma should be mushroom-like and texture should not be slimy. A very slight smell of ammonia is normal, as this is produced by the tempeh as it grows. Tempeh is low in saturated fats, has no cholesterol and is comparable in protein (19.5%) to chicken (21%), eggs (13%), and beef (20%).